In Gloucester, Temple Ahavat Achim members attended a double feature on Christmas Eve. Many Jews spend the Christmas holiday at the movies after eating Chinese food, but Temple Ahavat Achim does it a little differently. 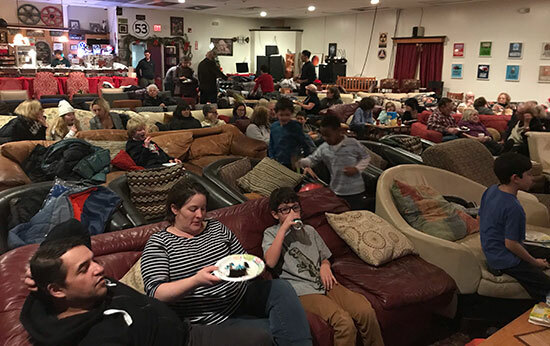 The Gloucester synagogue goes to the movies and gets takeout, yachad – all together. For the third year, TAA spent Dec. 24 at the Cape Ann Community Cinema (the one with the couches!) watching a double bill of the animated film “The Iron Giant” and “Home Alone,” a perennial holiday favorite. The cinema encourages food, so members brought takeout into the cinema. Christmas Eve also happens to be the birthday of one of TAA’s younger members, Jasper Eck, so a giant cake followed the meal.